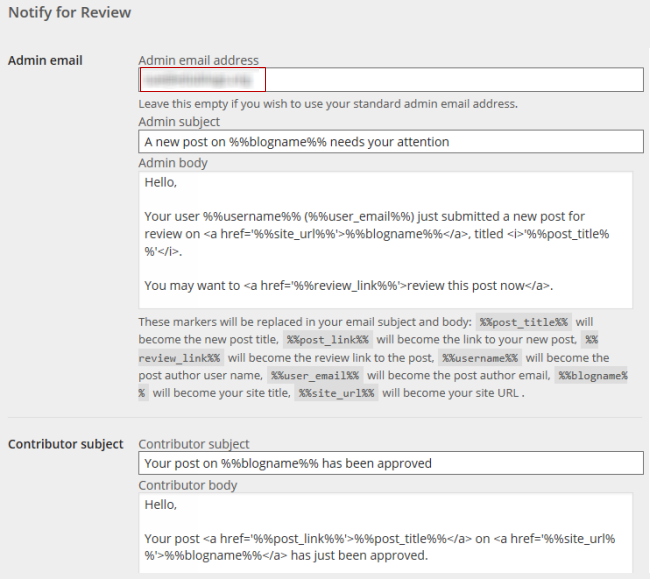 The Review Notifications plugin notifies administrator of posts pending for review. Contributors on a group blog. Student users on a class blog when My Class > Settings is set to “Yes, with moderation – able to submit post pending review on class blog”. Student users on a student blogs when My Class > Settings is set to “I must approve all posts – use if you want to check all posts before they are published”. When used on student blogs you need to activate and set up the Review Notification plugin on each individual student blog. Most teachers check posts pending review on student blogs using the pending folder in the Reader. 2. Add your admin email address.